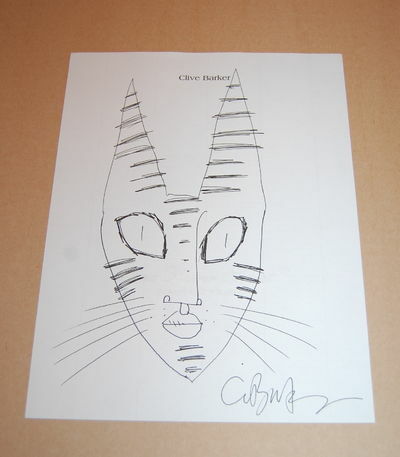 viaLibri ~ Clive Barker Original Artwork. Tarrie Cat [Abarat]. With Two Letters of Provenance Signed. Clive Barker Original Artwork. Tarrie Cat [Abarat]. With Two Letters of Provenance Signed. 2003.. 11 x 8.5 inches.. Original ink sketch, signed on BarkerÕs personal letterhead paper. Tarrie cat sketch in the vein of the cats presented in BarkerÕs Abarat book series. Also included are two letters dated 2003 to scholar, artist, author, and cat lover, Patrick Eddington. First letter is original and signed, second letter, original and signed, has clean tears at bottom, a copy of the second letter is also enclosed for better display. ÒTarrie cats are anthropomorphic felines that live off the island of Ninnyhammer. Their leader is Jimothi Tarrie. Jimothi and other tarrie-cats prevent Kaspar Wolfswinkel from leaving the island and therefore his constant source of frustration.Ó [-Clive Barker Wiki, Abarat]. Patrick Eddington (aka Pat the Cat), teacher, scholar, writer, artist and cat lover, carried on extensive correspondence throughout his life with a staggering number of writers and artists, many whom he persuaded to submit works for his life-long ÒCat ProjectÓ, a culmination he wished to create into a large book and traveling exhibition. EddingtonÕs vision was sadly never realized. He passed away in 2016 at the age of 63.